With the state facing serious and deepening water challenges, voters on November 4th will be asked whether to approve Proposition 1, the Water Quality, Supply and Infrastructure Improvement Act of 2014. The ballot measure would raise $7.12 billion in new general obligation bonds along with reallocating an additional $425 million of previously authorized, but unissued, bonds to fund a wide range of water-related actions and infrastructures. When the full costs of the bond are assessed, including interest payments, Proposition 1 will cost over $14 billion and be the fourth largest water bond in California history. 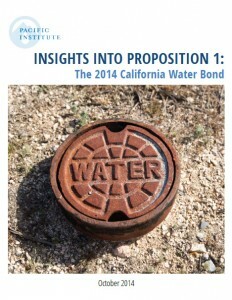 Read the Institute’s analysis of the next stage for the $7.5 billion water bond here.